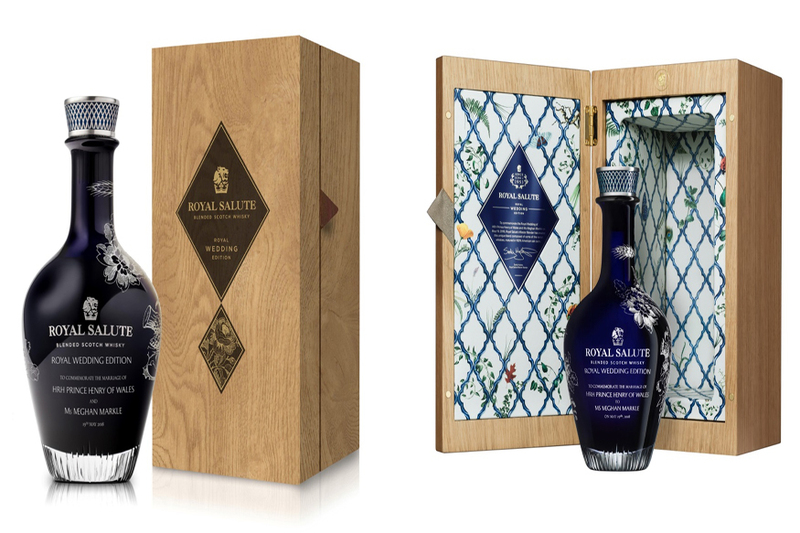 Scotch whisky-maker Royal Salute has created a commemorative bottle to mark the royal wedding for serious aficionados and monarchists who are willing to pony up an eye-watering $10,000 for a single bottle. Only 70 bottles of the Royal Wedding Edition have been produced for the occasion of Prince Harry and Meghan Markle's nuptials May 19. Created by master blender Sandy Hyslop, the whisky is a blend of some of the oldest and rarest whiskies from the distillery, aged in American oak barrels -- a special nod to the American actress. Likewise, the special blend is bottled in a hand-blown Dartington Crystal decanter, identified by a unique number, and presented in an oak -- American oak, of course -- box. The lining of the box features daffodils, the official flower of Wales (Prince Harry's official title is Prince Henry of Wales), and California poppies, to represent Markle's birthplace (Los Angeles). Royal Salute was founded in 1953 as a tribute to the British monarchy. Set in the Scottish Highlands, the distillery released its first bottles at the coronation of Queen Elizabeth II. The Royal Wedding Edition sells for $10,000.